Since the beginning of camera manufacturing, builders occasionally made special edition and "presentation" versions of their cameras. The equipment often commemorated a special event or was crafted as a personalized memento for an individual. The practice of producing special edition cameras probably started in the early years of photography and still continues today. 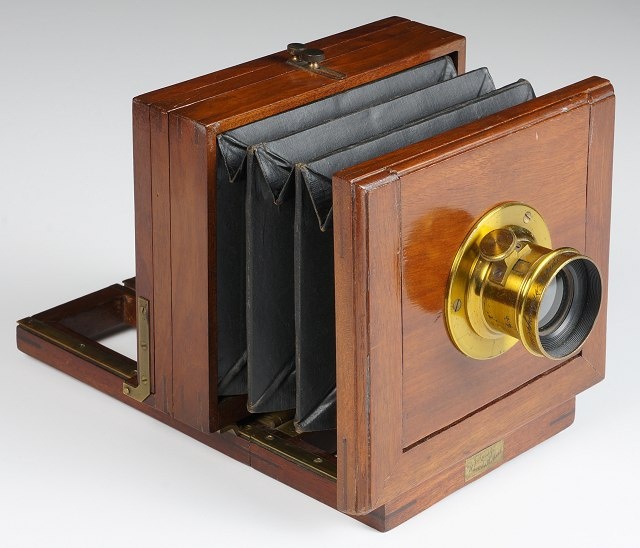 Presentation cameras are rare, while wood & brass examples made before 1900 even more so. This beautifully crafted American tailboard field view "presentation" camera was built in the unusually small 1/4-plate format. A brass plaque inset in the mahogany below the front standard proudly proclaims the owner's name and place of residence in flowing script: J Russ Jr., Haverhill, Mass. The camera's construction is far above average with design hallmarks and finish similar to apparatus made by the American Optical Company. Construction details include a nicely made brass ground glass release latch (spring-lift design) and ebonized wood strips to retain the ground glass. In keeping with the overall quality, a fine Darlot No.1 Hemispherique Rapide lens was mounted. The camera has a brass presentation label dedicated to "J.Russ Jr. Haverhill, Mass."